Northeast short by over 20% for only 5th monsoon in 116 years, deficiency in other regions marginal. Season of wide variations ends with 9% deficit in country, reservoirs 3/4ths full. An uncharacteristically severe rainfall deficiency in the Northeast — 24% — has been the main cause for the overall 9% deficiency in the country at the end of this year’s southwest monsoon season. The India Meteorological Department (IMD) said Monday it was “very rare” for such a large deficiency in the Northeast. In the 116-year period from 1901 to 2017, only in four previous years —1992, 2005, 2009 and 2013 — has the deficiency in the region exceeded 20%. “One possibility for the shortfall is that the monsoon trough that usually moves towards the Northeast did not happen this year,” Ministry of Earth Sciences Secretary Dr M Rajeevan told The Indian Express. “This kind of deficiency in rainfall is very rare,” he said. If the Northeast had received normal rainfall, the all-India rainfall would have been 96% of the Long Period Average, the IMD said. The distribution of rainfall across regions other than the Northeast — Northwest, Central India and Southern Peninsula — was “satisfactory” and “well distributed as predicted”, the IMD said. The deficiency in these areas was marginal: 2% each in Northwest and Southern Peninsula, and 7% in Central India. While a preliminary analysis shows that the sea surface conditions over the Equatorial Pacific (El Niño conditions) did not have any adverse effect on the performance of monsoon rainfall, the IMD has also planned a detailed scientific analysis by the end of December 2018. The 2018 monsoon has been characterised by “large day-to-day variability” within the season. The Indian Express had earlier reported on official IMD data that many cities in the country received almost their entire rainfall of the season in a small window that added up to just a few days to a few weeks within the four-month season (June 1 to September 30). For instance, in 22 cities with sizeable populations, 95% of the monsoon precipitation occurred over three days to 27 days on average, according to the IMD’s analysis of rainfall data. The IMD has said that “many intense rainfall events during the season have led to flooding like the Kerala floods”. The season also witnessed formation of a large number of low pressure systems over Bay of Bengal and their westward movement across central India, it said. The spatial distribution of this year’s rainfall is also reflected in the storage capacity of the country’s reservoirs. Figures released by the Central Water Commission (CWC) show that the country’s major reservoirs have a total of 122.514 billion cubic metres (BCM) in live storage, which is 76% of their total live storage capacity. This is 117% of the live storage of the corresponding period last year and 105% of the average storage over the last 10 years. Of the five regions, storage in reservoirs in Northern, Eastern, Central and Southern regions is higher than during the corresponding period last year. Storage in the Western region, which includes 27 reservoirs in Gujarat and Maharashtra, is less than the storage of last year and also less than the 19-year average storage during the corresponding period, CWC data show. Out of the 91 reservoirs, 75 currently have more than 80% of normal storage and the remaining 16 below 80% of normal storage. Of the latter 16, six have up to 50% of normal storage. 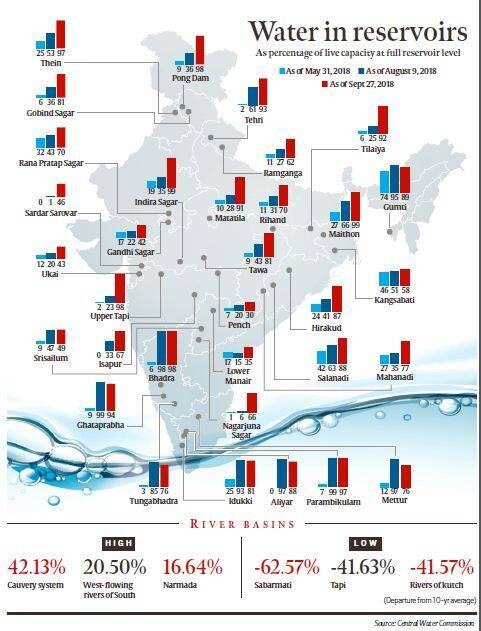 CWC figures show that the Sabarmati river basin is highly deficient, while the Tapi, the Mahi and rivers of Kutch are deficient. Data from the Ministry of Agriculture show that the overall crop acreage during the kharif season is higher by 2.6% as compared to the country’s highest ever acreage/record food production during 2017. The IMD said that the resultant acreage is largely the result of a good soil moisture distribution across the country. Adequate soil moisture available over northern parts of India may help the rabi crop during 2018-19, it said. 1 Is newly traversed passage through the Arctic about to revolutionise shipping?